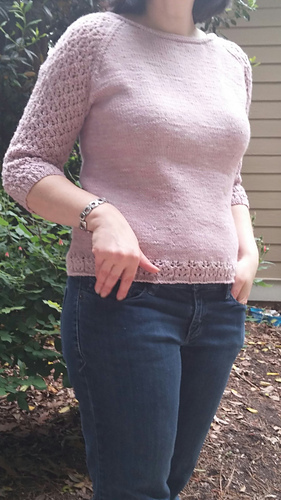 in St st; 23 sts and 30 rnds = 4" in lace patt. 35 (37 3/4, 41 1/2, 44 1/4, 48 1/2, 51 1/2)" bust circumference. Pullover shown measures 37 3/4", modeled with 1/4" of positive ease. Finished Size 35 (37 3/4, 41 1/2, 44 1/4, 48 1/2, 51 1/2)“ bust circumference. Pullover shown measures 37 3/4”, modeled with 1/4” of positive ease. 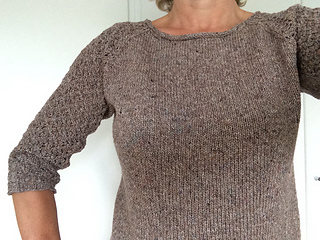 Yarn Schoppel Wolle Relikt (70% wool, 30% nylon; 137 yd 125 m/1 3/4 oz 50 g): #7693 mocha, 8 (8, 9, 10, 11, 11) balls. Yarn distributed by Skacel Collection, Inc. Needles Size 6 (4 mm): 32” circular (cir) and set of double-pointed (dpn). Adjust needle size if necessary to obtain the correct gauge. Gauge 21 sts and 28 rnds = 4” in St st; 23 sts and 30 rnds = 4” in lace patt. Reimagine the baseball raglan with lace and stockinette. 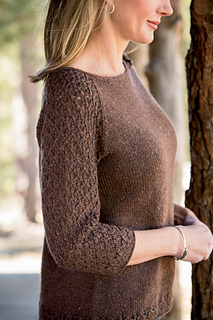 The Brick Lane Pullover makes a comfy piece with positive ease in a recycled wool yarn. The many fibers in each strand of the yarn create a tweedy look.